A few weeks ago, we finally visited Luxembourg, our 61st country. In this post, I’ll tell you about the things we’ve covered during just one day in Luxembourg and what else can you see in Luxembourg in winter (what we actually couldn’t see for some reasons – listed below). If you’re planning to visit Luxembourg and you have a family, it makes perfect sense to buy a Luxembourg card, which costs 27 euros a day (for up to 5 people) and includes local transport and entrance to many museums and landmarks as well as great discounts for tours and attractions. We were provided with Luxembourg card by Visit Luxembourg and would like to express our gratitude to visit Luxembourg for that! Due to the ticket availability, we arrived to Luxembourg on Saturday night and had to leave on Sunday night, so we had 24 hours in the country. That was actually more than enough to see the capital! So basically, we spent in Luxembourg just one full day. That would be the same if we arrived early in the morning and left around 10 pm in the evening. So, we arrived, checked it at our hotel Ibis Airport and woke up at 8 am to take a bus to the city centre. Note, that all the buses are free in Luxembourg on Saturdays (which is really awesome). However, we arrived on Saturday night and had to travel by buses on Sunday, so that awesome incentive didn’t apply to us. Our main point of interest in Luxembourg were the Casimates. So we were really sad and disappointed when we found them closed for a month for some maintenance. Instead, we decided to take a panoramic walk around the old town and see it from various angles. I must say, that the old town looked really photogenic with a lot of snow that fell on the city overnight. That was crazy and that happened way before the Beast from the East hit the entire Europe in the beginning of March 2018! So we were the witnesses of something unusual in Luxembourg (that soon became quite usual). We also went to the Palace and had a nice hot chocolate in the world famous Chocolate House of Natalie Bonn. The Chocolate House is really a must in Luxembourg and it doesn’t serve just an ordinary hot chocolate, no, it has a giant variety of different kinds of chocolate and all you need is to pick up one! Later on, we continued exploring the city, took a dreamy photo in front of the castle, visited two main cathedrals of Luxembourg and finally, ended up in the Luxembourg Art Museum, which had the biggest elevator I’ve ever seen. Seriously, it could easily fit 30-50 people! The museum was actually very interesting because it was telling the story of Luxembourg and was really nice and interactive. I wish we had a bit more time there, but we only had 45 minutes, as the museum was closing! So as you can see, our itinerary was mostly walking and taking photos of Luxembourg. 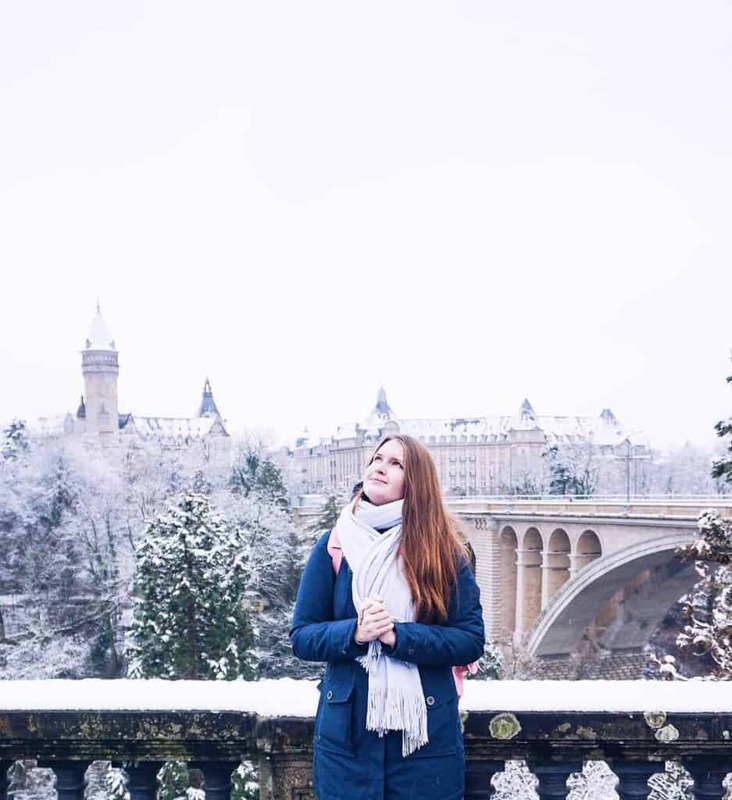 I believe the experience of Luxembourg in winter (we were in Luxembourg in February) is totally different from the experience of Luxembourg in summer or late spring, when everything is blooming and, in general, there are more things to do! I actually really enjoyed Luxembourg, however, I must say that what I really disliked in Luxembourg was the food. Maybe we were unlucky, but all the 3 places we visited for food, were really disappointing, especially the brasserie Bosso (would never recommend you going there). 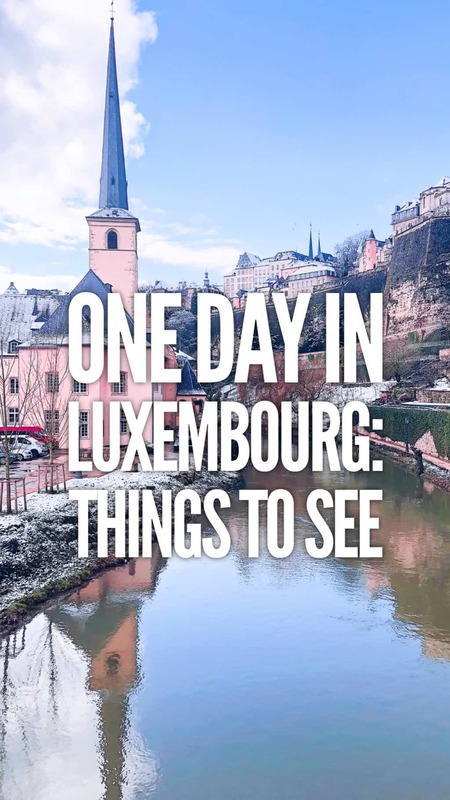 To summarise, I would say that Luxembourg is absolutely perfect for a one-day trip, weekend break or a short trip, where you can combine it with other counties, e.g. Belgium or France! Check hotel availability in Luxembourg (they sell out fast) here! Hope you enjoyed reading this post! Please let us know if you have any questions. Please note, that this post contains a few affiliate links – that means we’ll get a tiny commission if you buy something via our link at no extra cost for you!